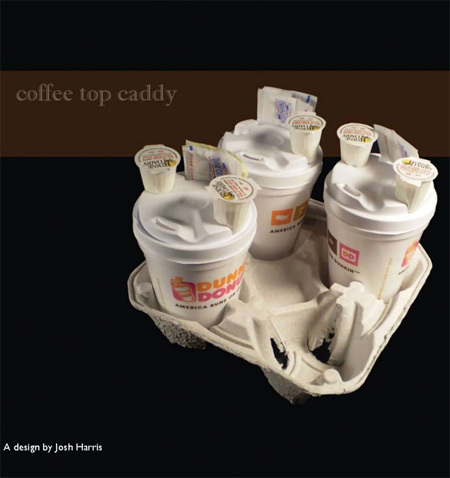 Coffee Top Caddy by Josh Harris is designed to help the coffee runner with people’s orders. Rather than remember what his coworkers want, he can place the coffee accessories onto the tops of their coffee cups and everyone will be able to customize their own drinks to their liking. too bad we dont have dunkin.donut at my place~i want a coffee now! Great job to Josh Harris and his team. I love the design, but does the world really need more convenient throw away cups? Also, stocking the lid fully with every order would just encourage additional waste, for those who do not want 2 creams/2 sugars. I’m actually a little surprised that nobody thought of this sooner. It’s genius. Encourages waste. I just a bring a list and my local shop uses a grease pencil and marks the names on the lid. As someone who’s worked at a coffee place for quite some time, I’d have to say this idea is useless. 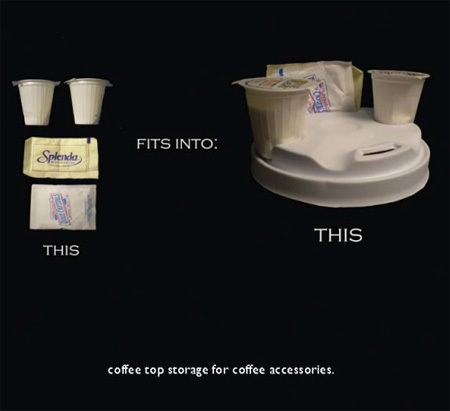 Just put all the side stuff in the third, empty cup spot (see photo 1 ‘Coffe Top Caddy’). If all spots are occupied and you can’t fit eveyrthing into the open space in the middle, then any coffee shop worth their salt will have some sort of paper baggie. Coworkers then take what they need from that. Is that such an ordeal? whats the point of being able to store something on top of a cup when you’re just gonna pour it in and throw it away anyways? what if you like more than 2 creams? no mindful coffee shop would buy these because they do all the work for you or you’re expected to make your coffee taste good before you go anywhere with it. I love great ideas and this is GOOD! I have a patented “self stirring” coffee cup lid. 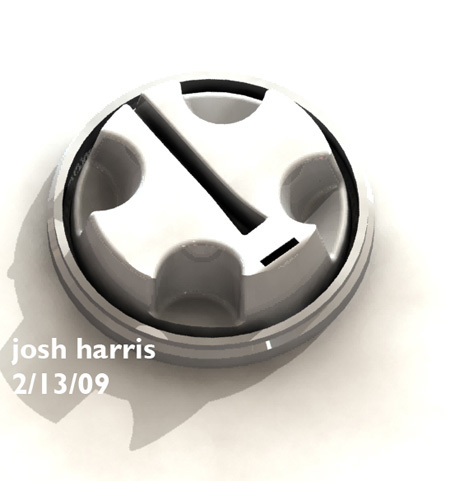 You have a great idea, try to license it to a coffee or lid company, if you haven’t already. I don’t see the point. It is really just laziness. I think it is cool but not needed. Why hasn’t this been thought of already? It’s ingenious! Damn, you need to market that right now. Haha, sweet. Yes but where does my sandwich go!? What a stupid wasteful idea, and can be replaced with one of the millions of paper bags we have in each shop already. Sorry you wasted your efforts. This is a sick idea. The lid is great. The creams and sweetners do not have to go to waste. They can be put in the condiment drawer in the office for all the times you need them. And I’m sorry, the little paper bags are more wasteful than just fitting them in the lid Mr. Dunkin Donuts Rep. Why can’t we all just appreciate innovtive ideas. Why not get on Starbucks for their little spill savers that will be sitting in landfills for years. This is RE-INVENTING something already in use. Pointless. Dunkin makes your coffee how you like it. Unless you get a box of Joe. Millions of years ago, trees died and were compressed over time into oil. Then they’re dug up, turned into tiny containers that you use for five minutes, and then thrown into a trashheap – hundreds of years after you’re dead, they won’t have changed. If you need 20 cups, bring a damned thermos, a jug of milk and a sugar bowl. The coffee will still taste good in an hour and you can wash it and use it for a decade. It’s an interesting idea but seems more like waste to use. I work in a coffee shop and most people in the place I work anyway use much more than 1-2 creamers and 1-2 packs of sugar for their drink. Also, having to pack each cup separately with creamers and sugars would take a lot longer than putting a handful of them into the empty cup slot or into a small bag for people to just take what they need later on. Definitely a waste of time and effort. I’m confused here…it looks like that one picture can hold 4 creamers and the slit on the top for the sweeter is is different. Is that just a different lid? It is a slick idea, but it’s coming at a time where consumers and businesses alike are becoming hyperconscious of packaging and waste. I’ve noticed that at McDonalds they now want to add my sugar and cream for me when I order coffee and are reluctant to dispense those little creamers and sugar packets. And a lot of coffee shops dispense their creamer in thermoses. I think this is genius for people doing the coffee run. If you aren’t making a coffee run for a bunch of people, don’t stick any milks in the lid. Duh. The lids are plastic so the green people can put them in recycle bins. Then you can feel better about yourself. Its a recursive application of the cup holder, and it’s excess waste in manufacturing. Great idea for the corporate sector and a solid first draft. However, you should revisit what made the Solo Traveller lid so great — it contained any spillage between the lid and a drinker’s lips in a reservoir Your design lacks something similar though it could very easily be added. As it stands, though your design will make life easier for whoever buys coffee for the group (or for travellers who don’t pre-mix their coffee on the go), spills will be more likely for drinkers. Just make the lids edible. So instead of more waste, we have more waist. there, not their. sorry to be annoying. between the cups placed inside the carrier?? the idea its self is very smart, a novelty really, but is this going to raise the cost of my cup of joe? Coffee costs enough as it is these days. Most coffee places serve crappy coffee anyway, its better, and cheaper to make your self. This design is defiantly useful to a certain % of people though. Find those people and market it to that specific group. Even if the idea doesn’t hold up for long in the real world, you could still make profits selling the idea to some company who can clearly see its limited potential? Indeed Liz you are correct. Thank you. Would you like to have an edible coffee lid with me? They are Fresh from the oven. I have Regular and decaf. So American, a design celebrating wasteful packaging. More paper and plastic to throw away. No worries, we’ll just build another planet…right? Nice idea, but will waste storage space from not being able to stack very compact. 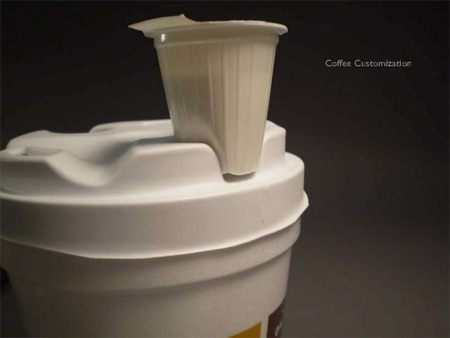 As a simple modification to add function to the existing lid, novel and a very commercial gimmick. Really can’t understand why people are bitching about waste- This design doesn’t create more waste – it simply changes the shape of the existing lid slightly. A useful idea for some, others not, the extra feature is there if you want it no extra waste. I like this! Very smart! Where did you have the prototype lid manufactured? I am amazed. Do people really drink that milk that comes in those tiny pots of their own free will? I thought they were only for if you were absolutely desperate, trapped in a hotel room late at night or something. Who knew?! This lid is wasteful. I work in a cafe doing over 120kg coffee per week with nothing but takeaway cups and I am disgusted with all the waste. This lid has a greater surface area than the traditional lid and therefore requires more plastic (ie extractive natural resource or oil) to produce. Compostable/recyclable coffee lids and cups are available in Australia where I am from. If you are an intelligent and thoughtful person, you would bring your own mug. How hard is it, really?